This Lightly Sweetened Sparkling Meyer Lemonade is bright, tart, and effervescent. It’s impossible to be in a funky mood when you’re drinking sparkling lemonade. Impossible! A bright, effervescent sparkling lemonade made with Meyer lemons. Just sweet enough to take the edge off the tartness. Combine all ingredients in a resealable bottle. Close bottle and shake until well-combined. Let lemonade sit for a few minutes before opening (and open carefully!). Add ice cubes, additional agave nectar, and lemon slices when serving if desired. HA! You and I must be on the same wavelength! I made something similar yesterday. I can’t find Meyer lemons here to save my life. Great minds think alike. 🙂 I had trouble finding Meyer lemons when we were in Wisconsin–I suspect that being closer to the source helps. And I think these were the last of this year’s crop. They weren’t looking too hot. 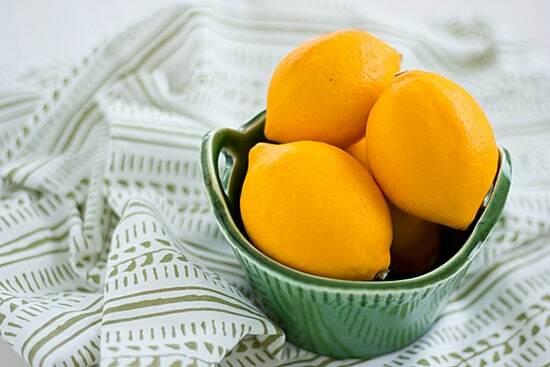 I feel like I’m always on a lemon kick–I can’t get enough of them! Love that life handed you lemons this week and you literally made lemonade 🙂 Sounds like a delicious way to welcome the warmer weather. I know I said we were done with trees, but we couldn’t resist planing a key lime/meyer lemon cocktail tree. It’s teeny tiny so it will probably be a while before it bears fruit, but I can’t wait! Hope your week continues to improve from here. Yummy! This sounds delicious, too. Sadly, I haven’t seen Meyer lemons in ages…but I do have a Soda Stream and a grapefruit – maybe I’ll give that a whirl! Ooh, I need to try mixing grapefruit juice with sparkling water. I think that would be good! I’m glad your week is finally picking up! That stinks about the camera. I’ve made lemonade before, but never with meyer lemons or agave. I have yet to see meyer lemons sold in the supermarket here (I was shocked when I finally saw blood oranges one day), but if I ever do I am making this! I had never been able to find them until we moved to the South–I’m assuming they’re easier to find here because we’re closer to Florida? They sell little Meyer lemon trees that you can grow inside though: http://www.logees.com/Lemon-Meyer-Citrus-limon/productinfo/C2004-2/. I want one! I love Meyer lemons! This looks so refreshing! I love them too–I wish they were available year-round! The Sodastream is amazing. I only drink soda on Saturdays, but I drink a lot of sparkling water & sparkling water/juice mixes, so it is awesome for that. I think now there’s another thing that you can use to carbonate water–it screws onto bottles. I don’t know what it’s called, but I’ve seen it at Williams-Sonoma. My camera is fine, but my lens broke. My husband put it back together, but it was having trouble focusing, so I bought a new (different) one which came in the mail yesterday. I am loving it! This makes me want summer to get here!! I know, this would be perfect for summer if Meyer lemons were available then! This sounds so simple and perfect for summer! I don’t think I’ve ever tried Meyer lemons but I keep seeing recipes that use them that I want to try! They have a really distinctive flavor and they’re so fragrant–I love them! I don’t think I ever saw them in the grocery stores when I was in Wisconsin, so I’m happy that they’re easy to find in North Carolina. I’m sure as they become more popular, they’ll start selling them in more locations! I’m not sure what to say besides YUM. I love lemon and I love sparkling beverages so this is heavenly! I am a big fan of lemonade but I’ve yet to have a Meyer lemon…this is a fantastic idea! man I have got to try this- it looks like a perfect summer drink! That looks simply divine. I should make a batch of this soon and add in some raspberries. This would be so good with raspberries! Or strawberries too. This looks fabulous! I love the taste of Agave and I have a soda machine as well. I need to put this together soon! I love how this post is literally about life giving you lemons- and then your grocery store having REAL lemons! 🙂 Anyway the recipe sounds so yummy & summery! I know, I didn’t even realize that until after I posted it! This sounds so yummy for a hot day! Shame theres no chance of getting these in the UK :o( You should try lemon, water and citric acid mix.